We’d love your help. 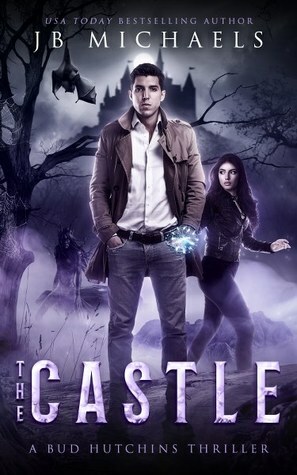 Let us know what’s wrong with this preview of The Castle by J.B. Michaels. Barely catching their breath, Bud, Ivy, and Maeve find themselves pitted against the Chicago police, the FBI, and the world’s most powerful vampire. Will they escape injury-free or will the fangs of doom pierce their jugular veins? The answers can only be found in The Castle: A Bud Hutchins Thriller. The three slayers of the supernatural will No rest for the wicked they say. The three slayers of the supernatural will face their most formidable threats, seek solutions to their most important problems, and be forever changed. To ask other readers questions about The Castle, please sign up. With his technology stolen and his robot beheaded, things didn't seem as if they could get any worse for Bud. That was until the police arrested him, handing him over to FBI authority. The problem with being a genius, capable of amazing feats, is everyone wants your brain, especially the government. With promises of a lead on his grandfather Bud is tempted, however, soon more pressing concerns become paramount, concerns leading them to an ancient castle, and possibly their most dangerous challe With his technology stolen and his robot beheaded, things didn't seem as if they could get any worse for Bud. That was until the police arrested him, handing him over to FBI authority. The problem with being a genius, capable of amazing feats, is everyone wants your brain, especially the government. With promises of a lead on his grandfather Bud is tempted, however, soon more pressing concerns become paramount, concerns leading them to an ancient castle, and possibly their most dangerous challenge to date. A string of missing students, an ancient monster, and an abducted ally, Bud sure has his work cut out for him this time. This story is a thrill ride from start to finish. Bud, Ivy and Maeve are thrown into a battle against a formidable foe who is out to destroy or rule the world, whichever comes first. Mystical monks, shapeshifters, killer robots, vampires...what's not to like. This was my first adventure with Bud and I have to admit that I was a little lost since I had not read the previous two books. I am in the process of catching up now, and then will be ready for the next thrill ride. I was given a copy of the This story is a thrill ride from start to finish. Bud, Ivy and Maeve are thrown into a battle against a formidable foe who is out to destroy or rule the world, whichever comes first. Mystical monks, shapeshifters, killer robots, vampires...what's not to like. Though this is the 3rd book in the series, this is the 1st one that I've read. All in all a good read with a likable cast of characters. An interesting plot keeps you engaged but since this was 3rd book and I had no background information it took me a while to grasp everything. Once I had caught up with what was happening it was a good & enjoyable read. I received an arc of this book from the author. This is the first book I read in this series so I am late to the party but I really enjoyed this book. It had adventure and romance of sorts. This book made me want to read the first two books. J. B. Michaels writes about unique characters. Read this book after you have read the first two and you won’t regret it. This is the first book in the series I've read, but it's easy to catch up with the characters. Fun and well written I really enjoyed this one. Bud Hutchins thrillers are exactly that, thrillers. They're also thrilling, full of thrills and a thrill ride. I can't say enough for this series, whose author keeps churning out one great book after another, each more exciting than the last. You'll be on the edge of your seat, with bated breath, as you wait to see if they'll be able to free themselves from each perilous predicament. In this outing, Bud, Maeve, Ivy and The Order are facing some of the most terrifying challenges of their lives. Bu Bud Hutchins thrillers are exactly that, thrillers. They're also thrilling, full of thrills and a thrill ride. I can't say enough for this series, whose author keeps churning out one great book after another, each more exciting than the last. You'll be on the edge of your seat, with bated breath, as you wait to see if they'll be able to free themselves from each perilous predicament. USA TODAY BESTSELLING AND AWARD-WINNING AUTHOR! Greetings! For the official site of JB Michaels head on over to http://mistermichaels.com/ for two free books! Married and with a son, Michaels has USA TODAY BESTSELLING AND AWARD-WINNING AUTHOR!